Sussex have signed veteran seam bowler Jon Lewis on a one-year contract following his departure from Surrey. 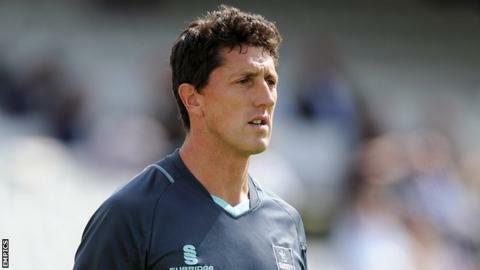 The 38-year-old former England player spent two seasons at The Oval after 17 years with Gloucestershire. "I'm really excited to be joining Sussex, a club I have admired from a distance for a long time. I'm looking forward to a new challenge," he said. "I am really confident that I can make valuable contributions to the team across all competitions." Lewis, who made his first-class debut in 1995, only appeared in two County Championship games for Surrey in 2013, but featured regularly in both limited-overs formats. He has taken 832 first-class wickets at an average of 26.15 during his 19-year career, and over 360 in the shorter forms of the game. The medium-pacer's sole Test appearance came against Sri Lanka in 2006, but he also played in 13 one-day internationals and two Twenty20 matches for England between 2005 and 2007. Sussex cricket manager Mark Robinson said securing Lewis' services for 2014 was "great news". He added: "Jon brings a wealth of experience and knowhow. He is still remarkably fit and ambitious as to what he wants to achieve in the game. "Jon bowled really well for Surrey last year in the Twenty20 competition, so he will not only give increased competition in the four-day team, but will give us greater options in one-day cricket."